The world's smallest one touch fittings feature 40% smaller volume ration and 20% smaller O.D. ration in comparison to coventional type. Compact one touch fittings are specially designed for pneumatic installations in equipment that are small and compact in size. Working pressure from 0~1.0Mpa (0~150psi), Working temperature from 0~60ºC (32~140ºF). 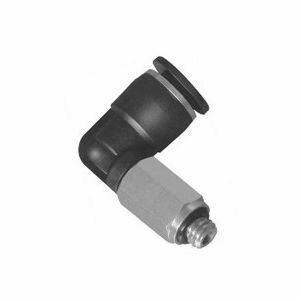 PLL-C series extended male elbow compact ( miniature ) work nicely together with PL-C series male elbows. Different point is that it is used for with fittings to avoid from interfering with each other by making the piping or tubing two-level. PLL-C series of extended male elbow compact ( miniature ) one touch fittings with M5, M6, 10-32, BSPT 1/8, BSPP 1/8, or NPT 1/8 thread, push in 3mm, 4mm, or 6mm ID tubing.